These days, I spend a lot of time in “meetings”. No specific agenda, just busy exploring my future as an “ex-VC”. As such, the other day, I met with the CEO of a recently VC-funded startup. This wasn’t our first meeting, so it presented a nice opportunity to see how slideware has become a working demo, soon to be a launched product. I was thoroughly impressed. But something didn’t feel right. Yesterday, during a board meeting in Rehovot, I figured it out. Their office had too nice of a view (actually, quite like the view from the Gemini office…). Other than the view, the office was pretty ordinary (with the exception of a fussball table…). But it didn’t feel like a start-up. I have been to visit many companies in the past, and have personally worked at start-ups in their very early stage. When Mercury was a start-up, we had a villa in Herzelia for home. My office (as Ms. Marketing) was in one of the living rooms, with a very flimsy divider separating me from one of the engineers next to me. Basic desk, basic chair, basic computer. As an “ex-VC”, I think that an entrepreneur that selects such an office is making a mistake. It might be “hardly a difference in cost”, or it might be “ready to go”, but in my mind, just doesn’t create the environment of a start-up. Call me old fashioned, but I’m still a believer in the “garage” mode. Even if you have $3M in the bank, you shouldn’t behave like you do. You need to make ever $ count - and that is reflected in everything that a company does. Not just selection of furniture and computer equipment, but what kind of car do you rent when traveling, where do you stay, what food do you bring to the office, etc., etc., etc. I know that VC’s are criticized for living “with a view”, while expecting entrepreneurs to sit in the garage. But lets think about that for a moment. The objective of an entrepreneur should be to make that $ last as long as possible, make as much progress in the business as possible, to get to the next funding point stronger, which allows to raise more money, at a higher valuation, and enables to attract better quality investors. If I was an entrepreneur, I’d skip the view. Go to Rehovot. Bring Shnitzel, Rice and Tehina to the office from a local foodery for lunch and really watch that $… It’s an old saying, but still rings true “Cash is King”. Well… today I announced to the world that after 4 funds, 2 continents and 13 years at Gemini, it is the perfect time for me to seek my next challenge. Yes, it’s a very difficult decision to make… When I was talking with people today, I asked them to think where they were 13 years ago. Lots of answers, but most people were in a very different place than they are today. Same here. So, with that comes the “what next” discussion. Well, there is nothing set yet. There are many different directions in which I may venture. Most important for me will be to find the opportunity that energizes me, in which I believe, and can help build to success. In this post, I would like to discuss “Too early for VC”. When an entrepreneur is just starting out, and doesn’t quite have the full story figured out, most people advise “don’t talk to them”. In some cases, I might agree, however, with the following HUGE caveat: Depends with whom would you like to talk! Yes, biased I am… since I (as well as my partners here at Gemini), prefer to see entrepreneurs as early as possible, knowing all too well that the discuss is potentially premature. By engaging at this nascent phase, we learn to work with an entrepreneur, learn how they think, work and see the progress (and they with us). It is very time consuming for us, but it is also extremely rewarding. Is there a risk that the company is totally off track, and will never be able to approach said VC again? Maybe. However, if you do your DD properly, and get an understanding of the person with whom you will be meeting, you can mitigate this risk significantly. This same point holds true for the next funding round. Once I have invested in the Series A, eventually that Series B will come along. There are specific targets that make a company “B ready”; some achieve B-readiness well in advance of their need to raise additional capital, with others it takes a bit longer. Post the A investment, many VC’s will be monitoring the progress of this company in order to be there in time to make the Series B investment. Often, we are asked for meetings before we are ready to fundraise. Often it coincides with a trip to Israel by a foreign venture capitalist. Being Israeli, we like to be opportunistic, since after all, the person is already here, etc. This, however, can be a mistake! Unfortunately, too often, the company can be judged as being “too early”, when it is in fact “too early” . The only reason the meeting was scheduled was in response to the opportunity presented - and it backfires and we find ourselves having to fix a situation that we shouldn't have really gotten ourselves into. So, what is my view? Tread carefully. And if you are indeed too early for a Series B meeting, and a Series B investor is “in town”, or wants an “informal meeting” or agrees to serve as a “dry run”, just decline politely (unless there’s something in the relationship that you feel will allow you to have a real value-adding open discussion…). When an entrepreneur sets foot in Gemini, they know that there is a well defined path leading to a potential investment, which includes meetings with the general partners, and of course a thorough due diligence process, with additional conversations/meetings with potential customers, partners, analysts, HR, etc., etc. We’re often asked how long does this take, which is an answer that varies greatly according to the company. We try and keep this process as transparent as possible, so that the entrepreneur knows exactly where they stand, what happens next, and what is the feedback that we are getting. It’s definitely an intense and iterative process involving us and the company. In addition to understanding the company and its business, we learn how to work together. We always suggest to the entrepreneurs that they do thorough due diligence on us as well. The relationship between a VC and an entrepreneur is literally “until death do us part”. I have to say, I was impressed. At the same time, I was surprised that never before had somebody outright asked me for such information. To the entrepreneurial community out there – knowing who is your VC partner is so important, I can hardly put enough ! marks on this statement!!! What’s good for one entrepreneur, may not work for another and vice versa. So my recommendation – do your work and hopefully, you can get the partner that is the best fit for your company on board. Sell too soon, and you leave money on the table. Sell too late, maybe there’s nobody left to acquire you. Don’t sell at all? Might just not leave a choice, but to build a big, successful company. There are many stories about companies that received offers, declined them, and then later either disappeared, or were acquired for peanuts. When AOL acquired Mirabilis (ICQ) back in 1998 for $287M in cash, many felt they were sold too cheaply. Could be. What I’m more worried about are companies that are sold sub-$100M, essentially as technology plugs, before they can scale and prove their value. This is where we all loose – entrepreneurs and venture capitalists alike. So how to avoid the temptation to sell??? Actually, this starts day 1. If you don’t swing for the fence, you’ll never hit a home run. Sometimes, a great swing, doesn’t quite make it, and you get a solid base hit. (Yes, my America roots show a bit). In my mind, why would you want to sell for $100M, if you can continue to build and make it to $350M? I certainly don’t like leaving money on the table!!! My investors don’t like it either, and actually, neither should the entrepreneurs, nor their spouses . There are 2 major industry events in Israel, that bring together venture capitalists and entrepreneurs (in addition to investment bankers, lawyers, accountants and other service providers): The annual IVA event, and E&Y’s Journey, which was held today. These events provide the best opportunity to mingle with the Israeli crowd - everybody is there. In fact, it is so crowded that there was not enough parking available (I parked in the last spot available on the roof, which wasn’t exactly an official parking spot), and for lunch, there were not enough tables, nor even standing room to properly enjoy lunch. 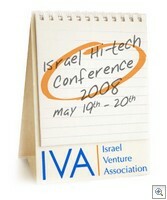 (Did anybody ask what are the differences between Silicon Valley and Israel???). The conference agenda focuses on industry topics such as, trends in the various investment sectors (software, media, cleantech, etc., etc.) as well as workshops designed for entrepreneurs, addressing issues such as raising capital, IP strategy, etc. However, as most of such conferences, it seems that most of the work is done outside of sessions. At any given point, the corridors were just packed! The organizers were actually smart (and kind) enough to design a large space, with cozy chairs, espresso and cookies, so that attendees could comfortably do what they would do in any case…. talk to each other. The 8th annual Rosh Pina film festival starts tomorrow, celebrating 40 years of Israeli television. It’s the place to be to discuss the future of television, how it is impacted by (and lives with) the Internet, mobile and other forms of new media and media delivery. Media is very high on our agenda here at Gemini. Recognizing the impact that technology is having on this entire space, we have been investing in the various parts of this food chain for several years already. At Rosh Pina, we hope to meet entrepreneurs that continue to think of how they can change this world. I won’t be there, but keep an eye out for my partners: Avi, Carmel, Orna and Sagi! I have a meeting with a VC and nothing to wear! Actually, what I wanted to discuss here is what to wear to a meeting with VC’s. I recall my first business meeting, way way way back when I was still an engineer, and asked to purchase a suit (yuck!) in preparation for my meeting with Hughes Aircraft in Orange County. One of the more experienced marketeers in my firm took me shopping for a grey skirt, white button down shirt and black jacket. I’m still horrified by that memory. However, first impressions are very important. It’s not only the quality of what you say, but how you say and present it. So, what should you wear to that meeting? First, you should be comfortable. If you don’t feel comfortable in your clothes, you certainly won’t look it. You want to be at your very best, at ease, focusing on the issues. Next, you don’t want to stand out. For example, an Israeli entrepreneur that would walk into our office in a suit and tie, when all of us are “business casual” would look like they’re trying too hard. The objective is to look professional, confident and comfortable. In Israel, you won’t go wrong with business casual. Israeli’s are very casual anyhow. However, shorts and crocs might not be the best choice for your first meeting.